House Community and Regional Affairs hearing on Tuesday, March 8, 2018 with Dan Ortiz answering questions on HCR 19, a bill urging Governor Bill Walker to issue an administrative order recognizing a linguistic emergency for Alaska Native languages. 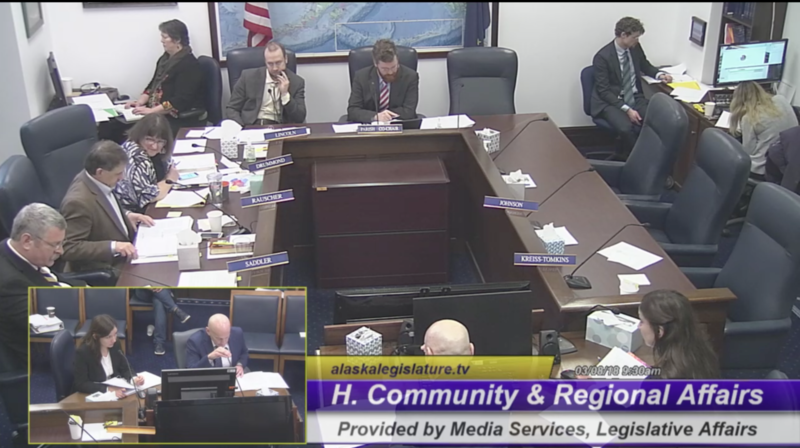 A bill to declare a state of emergency for Alaska Native Languages has moved out of one state House committee and into another. House Concurrent Resolution (HCR) 19 saw widespread testimonial support from Alaska Native academics, Tribal members, and non-Native Alaskans as well. The House Community and Regional Affairs committee passed the resolution after two days of public testimony on Thursday. Lance Twitchell, who is Tlingit, is an Assistant Professor of Alaska Native Languages at the University of Alaska Southeast and a council member of the Alaska Native Language Preservation and Advisory Council. He gave his testimony first in Tlingit, then English. In a report at the beginning of the year, Twitchell and the Language Advisory Council said that not only are a majority of the 20 recognized Alaska Native languages in danger of being lost at the end of this century, but direct action is needed on the legislative level. Along with nearly 30 people testifying, not including numerous written testimonies, Twitchell wanted to share accounts left by elders. Twitchell then recounted survivors’ stories of twentieth century Alaska Native boarding schools, with one Tribal elder recalling being doused with kerosene, and other methods used at the time to discourage the use of indigenous languages and cultural practices for generations of Alaska Native peoples. The Resolution was amended. Representative Dan Saddler wanted to stress how important language is to Alaska Native culture as a whole, and he also wanted to add language about urgency. HCR 19, sponsored by Representative Dan Ortiz, will now go to the House Rules Committee. Should it later pass in a House vote, Senator Donald Olsen, according to Rep. Ortiz’s staff, would introduce it in the Senate.